The Multidrug-Resistance-Protein 1 (MDR1) is a glycoprotein (therefore, also called P-glycoprotein, P-gp) that in humans is encoded by the ABCB1 gene. MDR1 is an ATP-dependent efflux transporter pumping xenobiotic compounds (such as toxins or drugs) out of the cells as a defense mechanism against harmful substances. MDR1 has a broad substrate specificity and distribution, e.g. in the intestinal epithelium MDR1 pumps xenobiotics back into the intestinal lumen, in liver cells it pumps them into bile ducts, in the cells of the proximal tubule of the kidney it pumps them into urinary filtrate, and in the capillary endothelial cells composing the blood-brain barrier, it pumps them back into the capillaries. 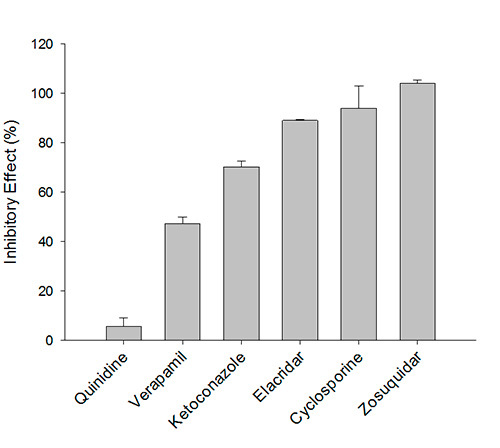 The excretion of xenobiotics by MDR1 pharmacokinetically can reduce the efficacy of pharmaceutical drugs. In addition, some cancer cells express large amounts of MDR1, which can decrease drug accumulation and leads to multidrug-resistant cells and often mediates the development of resistance to anticancer drugs.